Welcome to the home of Resolution Magic. Discover a series of techniques that you can learn and use on many occasions in the future. Therapy: If you have physical symptoms or psychological symptoms, we can work at reducing them. Resolution Magic will help you to reduce them until they disappear. If you have a chronic condition, it may take several months, minor symptom may take only a few weeks. Read the case histories of others who have used the Resolution Magic programme for many different conditions. If your symptom is not on the list, it does not matter, as the therapy can be tailored to deal with any symptom. How can this be true? Can almost all symptoms respond to Resolution Magic techniques? Read the section on ‘Neurological Wave Theory‘, and you will discover a different explanation of how symptoms develop. Resolution Magic is a programme to reduce symptoms until they disappear. The programme was developed by me, Olivia Roberts, modelled on my own experience. The development and description of this programme are in the book, ‘Chronic Pain and Debilitating Conditions Resolution – Make Unwanted Symptoms Disappear’ published by Findhorn Press. Resolution Magic – for working on unwanted feelings, or physical symptoms. You may have been told that you should ‘manage your symptoms’. Resolution Magic will help you to reduce your symptoms! Resolution Magic is a programme that aims to gradually reduce unwanted feelings and physical symptoms until they completely disappear. Although results do vary, you will discover how to reduce your symptoms and change unwanted feelings, and get your life back! The programme begins by re-educating the nervous system, and continues to reduce all of the factors that contribute to your unwanted feelings or symptoms. Unwanted feelings e.g. self-consciousness, nervousness, dread, fear, sadness, phobias, overwhelm. Physical symptoms e.g. pain, nausea, vertigo, indigestion, cystitis. See the list of over 100 physical and psychological symptoms in the side-menu. And it’s all done by simple techniques and mental exercises. If you wish to find a hypnotherapist or NLP Practitioner, visit the Hypnotherapy Association website. 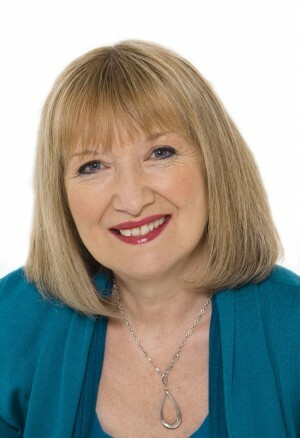 Olivia Roberts, author of the book, ‘Chronic Pain and Debilitating Symptoms Resolution: Make Unwanted Symptoms Disappear’. Discover all about the development of the Resolution Magic Programme, and step-by-step instructions in the book. Begin your own programme today! MPNLP = Master Practitioner of NLP. SQHP – Senior Qualification in Hypnotherapy Practice. HA Reg = Registered with the Hypnotherapy Association. 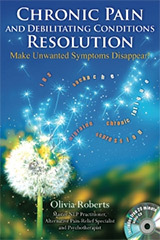 Welcome to Resolution Magic - a programme of mental exercises to make unwanted feelings and physical symptoms disappear! This book will lead you step by step through your own tailored programme. Address all of your issues. New to Resolution Magic? This 25-minute Resolution Magic clients’ video (just click on the screen above) features past clients, and also Olivia’s own theory – The Theory of Neurological Wave Syndrome. Wondering how you can watch these videos? Here is some guidance.. The mind controls the way we feel, and every action of the body. There is so much to do, and the only way all of this can be achieved is by creating a sequence for every task, and then storing it. Everything you feel, and every physical symptom too, is at the end of a stored sequence. Resolution Magic will teach you how you can change sequences, in other words, how you can change the way you feel, or any unwanted physical reaction or symptom. This set of tools, the mental exercises of Resolution Magic, are skills for life, so that no matter what has happened to you, or what happens in the future, you can change the effect it has on you. Wondering how you can watch the video? Here is some guidance..
disclaimer: results may vary. Please consult your GP – Resolution Magic can work along-side regular medicine. Disclaimer: The book does not, and cannot, provide individual medical advice, but rather is for general informational purposes only. My advice is not intended to be a substitute for individualized medical advice, diagnosis or treatment by a qualified professional who is aware of your medical history and has had an opportunity to examine you.